Preprints (earlier versions) of this paper are available at http://preprints.jmir.org/preprint/6129, first published Jun 06, 2016. Background: The value agenda in healthcare has created legislative reform, merit-based reimbursement systems, public reporting of surgeon scorecards, and patient-centered neurosurgical outcomes tracking. Though technological innovations for the intra-operative experience continue to abound, technological advances such as artificial intelligence, big data, and wearable technology have yet to become standard tools for outcomes measures in neurosurgery. 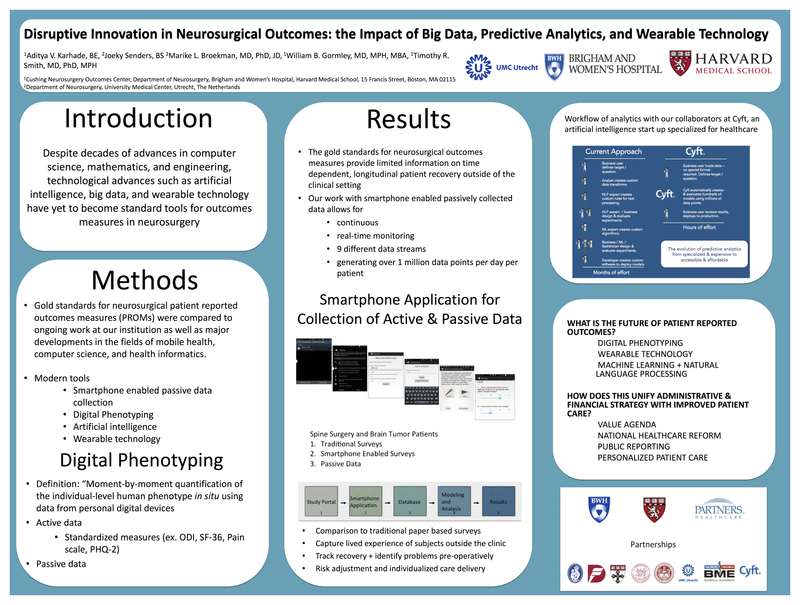 Objective: The purpose of this work was to review existing tools for outcomes research in neurosurgery and to characterize the disruptive innovation created by artificial intelligence, big data, and wearable technology. Methods: Gold standards for neurosurgical patient-reported outcomes were compared to ongoing work in our center as well as major developments in the fields of mobile health, computer science, and health informatics. Results: The gold standards for neurosurgical outcomes measures (pain scale, Oswestry Disability Index, Euro-Qol 5D, Short Form Health Survey, etc.) provide limited information on time-dependent, longitudinal patient recovery outside of the clinical setting. Our work with smartphone-enabled passively collected data allows for continuous, real-time monitoring of 9 different data streams generating over 1 million data points per day per patient. Artificial intelligence capabilities, including natural language processing and machine learning, quantify and digitize patient quality of life from electronic medical records, audio recordings, and free text notes. Quantification of patient outcomes is further aided by the creation of wearable physiological sensors specific to neurosurgery, such as a serum sodium sensing wearable with WiFi communication capabilities to prevent complications and readmissions of delayed symptomatic hyponatremia post-transsphenoidal surgery. Conclusions: Systems-level risk adjustment, high-value care, and real-time tracking of functional recovery is enabled by passively collected data. The future of outcomes measures in neurosurgery requires the translation of validated, gold standard assessments into the modern era of big data, artificial intelligence, and wearable technology. ©Aditya V Karhade, Joeky Senders, Marike L Broekman, William B Gormley, Timothy R Smith. Originally published in Iproceedings (http://www.iproc.org), 14.12.2016.